To manufacture productive and versatile road train trailers for Jamieson Transport in Western Australia, Bailey’s Body Builders specifies axles and suspension from Fuwa K-Hitch. Iron ore was Western Australia’s highest value commodity during 2015-16, accounting for more than $48 billion (71 per cent) of total mineral sales*. The state’s figures cemented its position as the world’s largest exporter of iron ore, with sales volumes reaching 756 million tonnes, up from 719 million tonnes in 2014-15. 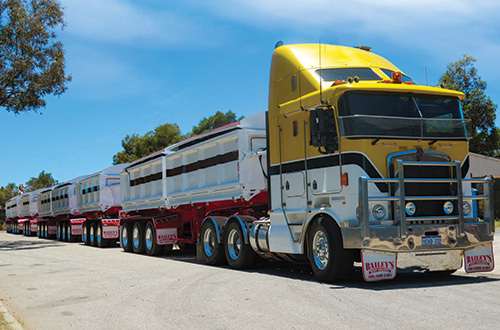 To meet the transport demand from the mining industry, David Bailey – owner of Bailey’s Body Builders – has been supplying the commercial road transport industry with road train trailers and heavy haulage equipment since 1989. Semi-retired – and coordinating operations with his son, General Manager – John Bailey, from their facility in Armadale, he has seen many changes in trailer design since the advent of the Performance-Based Standards (PBS) high productivity scheme. One of David’s regular customers is bulk haulage business, Jamieson Transport, which has one of the largest fleets in the Pilbara region, with a significant selection of transport equipment built by Bailey’s Body Builders. Jamieson Transport Workshop Manager, Willie Brennssell, says that he has recently taken delivery of a quin road train combination from Bailey’s, which has PBS approval to run 720km round trips between Port Hedland and authorised mines in Western Australia, hauling iron ore, manganese and copper concentrate. The quin has a Gross Combination Mass (GCM) of 200 tonnes and a payload capacity of 139 tonnes. To satisfy PBS requirements for lightweight tare, David confirms about 80 per cent of his customers specify Fuwa K-Hitch axles and suspension systems, which are also cost-effective and serviceable. While the quin is limited to its PBS routes, Jamieson can unhitch the A-trailer, allowing the trailer combination to function as a quad, expanding its road network access capabilities – highlighting its diverse practical applications. 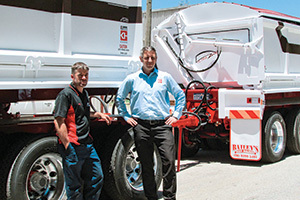 Fuwa K-Hitch State Manager for Western Australia and the Northern Territory, Ryan Ussher, says that his team provides running gear that is suitable for the region’s harsh conditions, and has maintained a great long-term partnership with the team at Bailey’s. The Jamieson Transport workshop engages in regular preventative maintenance because it is important to minimise downtime. 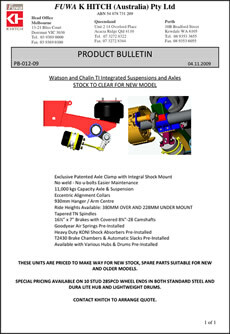 “In our experience, Fuwa K-Hitch components from running gear components to wheel bearings are readily available, which allows us to run a more serviceable and efficient fleet,” he says. With the ebb and flow of mining activity, and the need to shift bulk payloads efficiently, David and John Bailey continue to invest in Fuwa K-Hitch running gear to provide fleets like Jamieson Transport with optimised road train combinations, promoting efficiency and versatility. *Source: Government of Western Australia Department of Mines and Petroleum, Statistics Digest 2015-16.